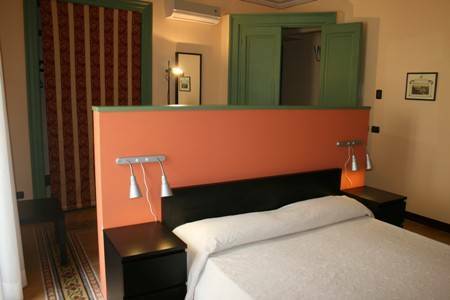 Nice and comfortable bed and breakfast located in Cefalu Duomo square with a terrace sea view. This establishment is currently being managed by the Provenza family and has just recently been restored. 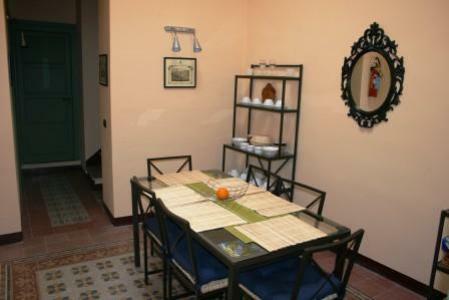 It is situated in a very nice building in the town centre of Cefalù with various shops and restaurants just around the corner. Apart from the sandy beaches, we can offer you nice furniture, air conditioning, central heating, and an internet connection. 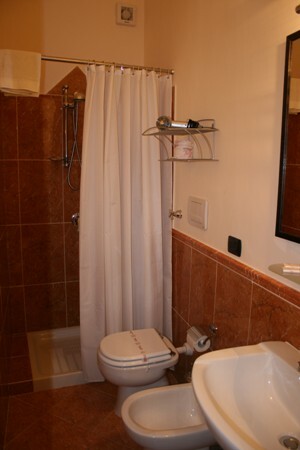 The accommodations are divided into one triple and three double bedrooms each with an en-suite bath, and shared dining area and kitchen amenities. The continental breakfast is served every day between 07:00 AM and 10:30 AM. If the weather allows, it's also possible to have breakfast on the terrace. This place is very comfortable for families with children. In fact, we offer baby cots, high chairs, and even baby baths. The kitchen is of course equipped with a microwave oven which can be used to heat baby food. The small town Cefalù is located 70km east of Palermo and is really worth a visit! 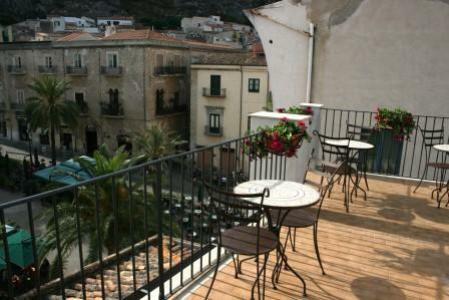 Cefalù is a picturesque fishing village that enjoys a splendid position between the sea and a rocky promontory. The town’s current name derives from the Greek word Kephaloidion, meaning head or chief, and the town saw its heyday under the Norman king Roger II, who decided to initiate the work on the cathedral in 1131. The town is divided in two parts; an old part that is mainly for pedestrians and has many nice little boutiques, and a new modern part with supermarkets, gas stations and car rentals. Corso Ruggero is the main street in the old town center, and it has many different shops and in cross-streets you will find many good restaurants. The old town center is dominated by the cathedral and the Rock rising in the background. The town’s history is chequered; many different kinds of people have governed it, for example the Arabs, the Greeks and the Normans. The historical heritage is reflected in architecture, location and the atmosphere. Today Cefalù has a population of 14, 000, but in the summer months this number is more than doubled. Cefalù has become incredibly popular in recent years; the town is fascinating and many tourists that come here choose to come back. Payment on arrival. 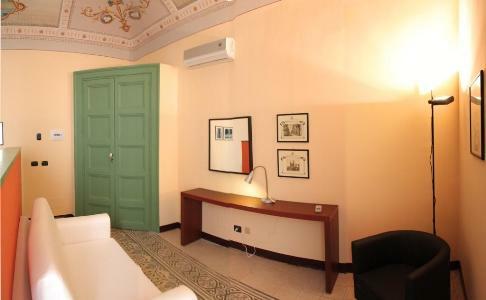 Cancellation: by cancellation the following charges must be paid: free of charge if the cancellation is made 1 day or more prior to arrival, 100% of the total rent for one night if the cancellation is made on the day of arrival or in case of ‘No Show’. The historical town of Cefalù’ is closed for traffic, so please do not enter by car. For free parking: at the beginning of Cefalù, you see on the right an AGIP petrol station and on the left Bar/Hotel St. Lucia, turn directly to the right. Follow the road, direction Messina (2km). At the cross you turn right, again direction Messina. After 50m at the Pizzeria Girotondo turn right, direction Hotel Pescatore. Follow the road to the left and continue the road. When you come to Hotel Pescatore (on your right), turn left direction PORTO. Please park your car down at the PORTO (harbour). For paid parking: enter the town and follow the national road. Pass the railway cross and follow the road (Via Roma). After 1km you come to a cross where you see an Agip petrol station, here you turn completely left and drive back the Via Roma. After 100m turn right at the cross go straight ahead. At the end of the road turn left and park your car at the parking next to Hotel Riva del Sole.